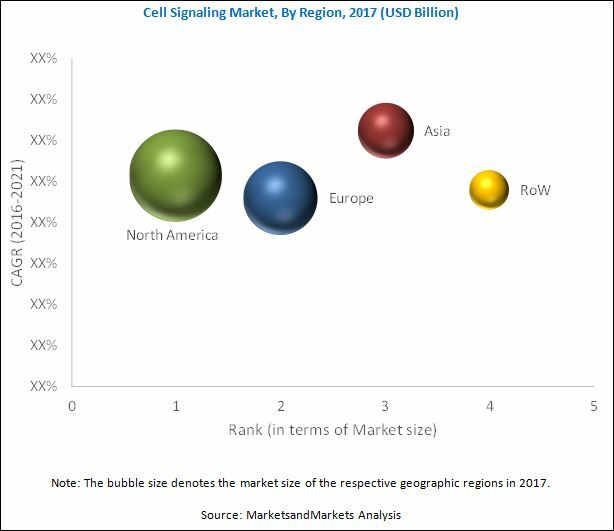 [212 Pages Report]The cell signaling market is expected to grow from USD 2.53 billion in 2017 to USD 3.51 billion by 2022, at a CAGR of 6.8%. This report aims to estimate the market size and potential for growth in the cell signaling market across different segments such as type, product, technology, pathway, applications, and regions. This study also provides detailed information regarding factors influencing the growth of the market such as drivers, restraints, challenges and opportunities. Governments of various countries are promoting and supporting cell-based research activities such as cell signalling, single-cell analysis, and stem cell research. A large portion of the funding from governments is provided to academic research societies to promote cell-based research, which helps in the evaluation of diagnostic and therapeutic applications of various types of cells in the management of chronic and infectious diseases. By driving research into the application and end-user industries for cell analysis, the availability of support plays a significant role in aiding market growth. The research methodology used to estimate and forecast the cell signaling market begins with capturing data from secondary sources such as WHO, NCBI, UN DESA, GLOBOCAN, CRG, and others. The bottom-up procedure was employed to arrive at the overall market size of the cell signaling market from the revenue of the key players. 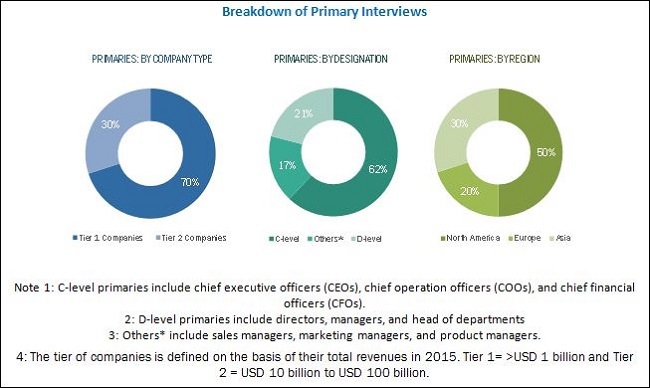 After arriving at the overall market size, the entire market was split into several segments and subsegments which are then verified through primary research by conducting extensive interviews with CEOs, VPs, directors, executives, and others. The cell signaling ecosystem comprises reagent and antibody manufacturers such as Merck KGaA (Germany), Becton, Dickinson and Company (U.S.), Beckman Coulter, Inc. (U.S.) (a subsidiary of Danaher Corporation), Thermo Fisher Scientific Inc. (U.S.), Bio-Rad Laboratories, Inc. (U.S.), QIAGEN N.V. (Netherlands), PerkinElmer Inc. (U.S.), Promega Corporation (U.S.), Bio-Techne Corporation (U.S.), Cell Signaling Technology, Inc. (U.S.), Abcam plc (U.K.), Miltenyi Biotec (Germany), Cell Biolabs, Inc. (U.S.), Full Moon BioSystems, Inc. (U.S.), Cisbio Bioassays (France), BioVision, Inc. (U.S.), Rockland Immunochemicals Inc. (U.S.), Tonbo Biosciences (U.S.), StressMarq Biosciences Inc. (U.S.), BPS Bioscience, Inc. (U.S.), Abeomics, Inc. (U.S.), RayBiotech, Inc. (U.S.), MEDICAL & BIOLOGICAL LABORATORIES CO.,LTD. (Japan), Sino Biological, Inc. (U.S.), and Santa Cruz Biotechnology, Inc. (U.S.). In 2016, Thermo Fisher Scientific Inc. (U.S.) acquired FEI Company (U.S.) to strengthen its high-performance electron microscopy business. In 2017, Becton, Dickinson and Company (U.S.) launched BD Resolve Single-Cell Gene Expression platform. This has strengthen the position of company in cell signalling market. In 2016, Cell Signaling Technology Inc. (U.S.) launched CellSimple Cell Analyzer. This helped company to strengthen the presence in cell signalling market. How the market developments of key players impact the overall industry? What are the restraining factors for this market? The cell signaling market is projected to reach USD 3.51 billion by 2022 from USD 2.53 billion in 2017, at a CAGR of 6.8%. The term “cell signaling” is used to define the complex interactive system of signals that regulates and mediate various cellular responses in the human body. Cell signaling is used to study signaling pathways of cells in drug discovery and therapeutic development, to distinguish drug resistance patterns in cancerous cells. It also identifies the major signaling pathways impacted by specific drug treatments. Cell signaling pathways—also called signal transduction pathways—act as connecting links between environmental stimuli and the corresponding cellular response. These signaling pathways mainly consist of proteins that can interact, move to specific locations, or be modified. Growth in the medical supplies market is primarily driven by rising incidence of chronic diseases, and availability of funding for cell-based research activities. Other factors that are also positively affecting the growth of this market are technological advancements in cell-based research instruments and growth in life science and biopharmaceutical industries. However, ethical issues related to embryonic stem cell signaling research and the high cost of cell signaling systems are expected to hinder the growth of this market. Based on the type, the cell signaling market is segmented into paracrine, autocrine, endocrine, juxtacrine, and other signaling types (neuronal and intracrine). The endocrine signaling segment is estimated to account the largest share of cell signaling market in 2017. By product, the cell signaling market is segmented into consumables (reagents, assay kits, antibodies, and other consumables) and instruments. In 2017, the consumables segment is estimated to account the largest share of the cell signaling market. Based on technology, the cell signaling market is segmented into microscopy, western blotting, immunohistochemistry (IHC), flow cytometry, enzyme-linked immunosorbent assay (ELISA), mass spectrometry, and other technologies (immunofluorescence and immunoprecipitation). The microscopy segment is estimated to account the largest share of cell signaling market in 2017. Based on application, the cell signaling market is segmented into research applications (stem cell, immunology, cancer, and other research applications), and medical applications. The research applications segment is estimated to account the largest share of cell signaling market in 2017. In 2017, the medical supplies market is dominated by North America, followed by Europe. North America is expected to continue to dominate the market by 2022. Asia is projected to witness the highest CAGR, centered at China, Japan, and India, during the forecast period. Research is an important application segment in the cell signaling industry and has witnessed significant growth in recent years owing to the increasing incidence of chronic diseases, technological advancements in cell biology instruments, and increase in the cell-based research activities across the globe. The rising number of patients suffering from chronic diseases such as cancer, diabetes, cardiovascular disorders, and neurological conditions has led to an increase in cell signaling-based research across the globe. According to the 2014 report of the American Heart Foundation, nearly 17.3 million people die due to cardiovascular diseases (CVDs) each year, accounting for 30% of global deaths. This number is projected to increase to 23.6 million by 2030. Moreover, according to the WHO, cancer is the second-most-common cause of death in the U.S.; 1,658,370 cancer cases were diagnosed in the country in 2015 (Source: American Cancer Society). The growing incidence of these diseases is one of the major factors driving the demand for cell biology-based procedures across the globe. What are the upcoming industry applications? Ethical issues related to embryonic stem cell signalling research is a major factor restraining the growth of the market. Research in cell biology necessitates the use of animals and humans, as animal and human cells are used in gene therapy studies that involve the recombination of genes and stem cell research therapies. These cells are also used for in vivo toxicity and pharmacokinetic testing of drugs that may harm animals and humans. In addition, stem cell research studies use human embryos for clinical applications that often lead to the destruction of the embryos. The major players in the cell signaling market include QIAGEN N.V. (Netherlands), Beckman Becton, Dickinson and Company (U.S.), Thermo Fisher Scientific Inc. (U.S.), Merck KGaA (Germany), Promega Corporation (U.S.), PerkinElmer Inc. (U.S.), Bio-Rad Laboratories, Inc. (U.S.), Coulter, Inc. (U.S.) (a subsidiary of Danaher Corporation), Bio-Techne Corporation (U.S.), Miltenyi Biotec (Germany), Abcam plc (U.K.), Cell Signaling Technology, Inc. (U.S.), Cisbio Bioassays (France), Cell Biolabs, Inc. (U.S.), Full Moon BioSystems, Inc. (U.S.), Tonbo Biosciences (U.S.), BioVision, Inc. (U.S.), StressMarq Biosciences Inc. (U.S.), RayBiotech, Inc. (U.S.), Rockland Immunochemicals Inc. (U.S.), Abeomics, Inc. (U.S.), BPS Bioscience, Inc. (U.S.), MEDICAL & BIOLOGICAL LABORATORIES CO.,LTD. (Japan), Sino Biological, Inc. (U.S.), and Santa Cruz Biotechnology, Inc. (U.S.). 13.8 Cell Signaling Technology, Inc.